Or should it be: See, Draw, Paint, ID? 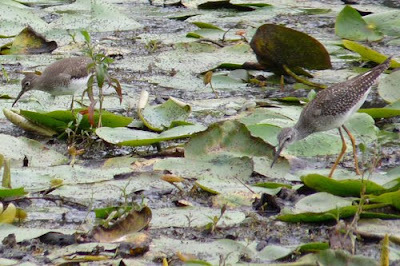 These questions came to me on arrival home from a 2700 mile driving trip to the Midwest, particularly Horicon Marsh in Wisconsin and Magee Marsh in Ohio. I think my brain wasn't fully functioning due to all the driving and much more caffeine than is usual for me. My mind was just sort of wandering after getting home Sunday night and I kept going back to one moment of the trip. 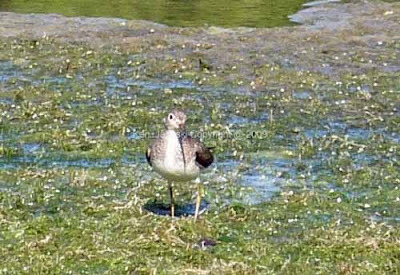 The occasion was a shorebird that I and my wife saw in the mudflats at Magee Marsh just as we were about to leave. It was very difficult to see amidst the mud and the water lilies. When we did see it, it was puzzling. 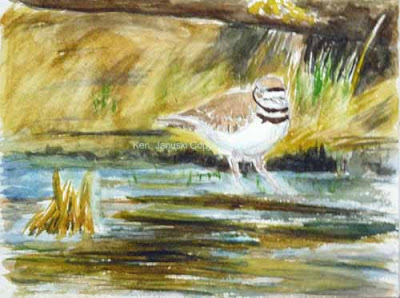 Some of the markings, like the way the white of the breast curves up into the flanks and the monocolor underwings indicated Solitary Sandpiper. But the yellow-orange legs and size of bill indicated Lesser Yellowlegs. We're just starting to get familiar with shorebirds so we were constantly referring back to Sibley for help. That, along with a single call note, confused us even more. Some aspects of the bird supported each ID. But that was just the start of the problems. There wasn't time to draw, since we needed to be getting on the road in order to reach our next hotel in Pennsylvania before dark. So we both decided to take some quick photos for later reference. Sounds easy right? Until we realized, I more than my wife, that we couldn't find the shorebird once we tried to shoot a photo! Where was he in all that variety of gray, green, brown and blue? After about 15 minutes of trying to find the bird, then focus him in the camera, and shoot the photo I came to a great realization: there were two birds! They were almost identical in shape, both had eye rings, both had yellowish legs, and they were very similar in size. They even fed in a similar fashion! The surprise answer to the ID question was: BOTH! 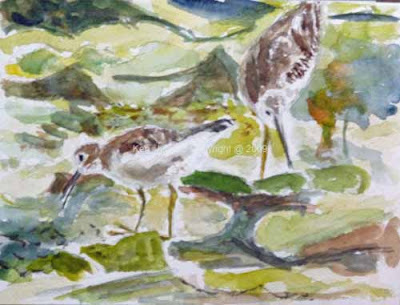 One was a Lesser Yellowlegs and the other was a Solitary Sandpiper. I'd seen both, thinking they were the same bird, and came up with contradictory field markings! All of this was prelude to what I thought about that first night back home though. My thought was that I'd placed seeing and identifying the bird above all else. I could have just tried to see it, sketch it, perhaps use that as the basis for a painting, and then at some later time, maybe when titling the painting, discover what the bird(s) actually was. Someone with my artistic background might easily first see the artistic possibilities for a drawing and painting and only much later worry about an id. I didn't and that I found interesting. 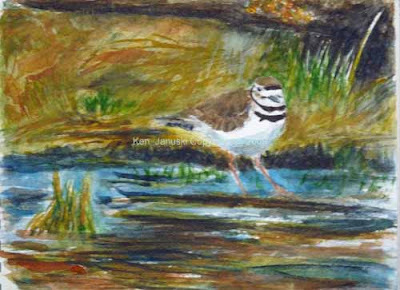 To me it seemed a metaphor for what I've been trying to do in my bird art: remain true to what I see, but also make sure that the end result is artistic, not 'just' a scientific sketch. I put 'just' in quotes because I don't mean to criticize scientific sketches. They are both valuable and beautiful. It's just that I really value art, probably more than science. And yet in this case I put science first. Perhaps this is just due to the fact that we were birding first and sketching second. Still I found it interesting. I think much bird art swings between these two extremes. 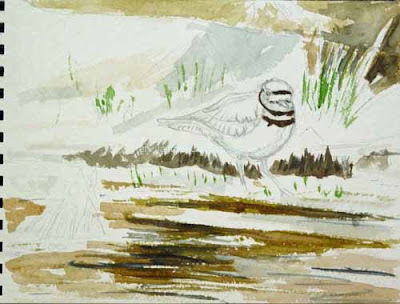 For some artists correct representation of a particular bird and species is paramount. For others the bird is just an excuse for 'making art.' I don't mean to come down on one side or the other and probably am smack dab in the middle. This little episode reminded me of that. And I do find it a comfortable and enjoyable place to be! By the way the watercolor at top is one that I whipped out this morning as an illustration for this post. I could have used 'struggle' just as well as 'scrimmage' but I've used the former all too often and today, as far as my football-ignorant self knows, is the first full Sunday of NFL football. No matter the word I think my intent is clear: I have difficulty with watercolor. I didn't have time to work from life today so used an old photo as the basis for this. I was very happy with my last pastel drawing but wanted to continue my pursuit of watercolor mastery, or at least watercolor competence! It would be easy to continue with pastel and charcoal but I do love watercolor. So I want to make sure that I continue to work in it. Eventually it will come easier. I'm not going to say much about this. But I will show many of the stages along the way. I started by putting in what I thought would be the darkest areas, as an experiment. Later I tried sponging out certain areas to regain some lightness and a new background. As the painting went on I used more wet into wet colors. Finally I reached the conclusion at top. The following are some of the stages on the way to it. 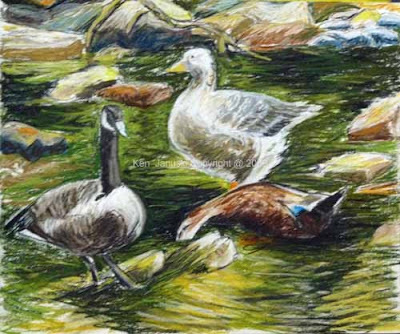 After sleeping on it I decided to go back into yesterday's pastel of Canada Goose, Graylag and Mallard at Valley Green. Though I really liked the white undeveloped area something told me that I ought to keep developing it just to see what it looked like. There was also the possibility that I was afraid to ruin a good start with continued work. So that is always the dilemma: are you quitting because it really is done or because you fear ruining a good start? The answer is never clear, certainly not to me anyway! By the way this is more or less exactly the way the geese and mallard were grouped. Because the Valley Green section of Wissahickon Creek is accessible by car it gets a lot of visitors. So the geese and ducks just hang out, waiting for handouts. 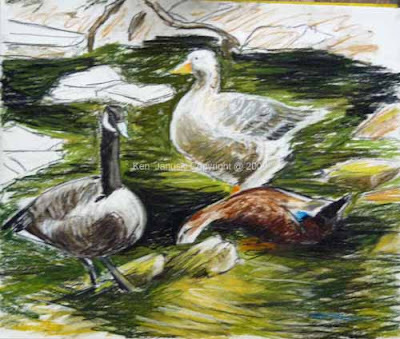 In all my work drawing geese and ducks at Valley Green over the last few weeks I always thought I really ought to do some more finished work using them as subjects. I'm not yet good enough with field sketching to base a finished work on it. So my last day there I took some photos. You see the result in this pastel. I have an almost pathological aversion to losing all the white in a drawing or a watercolor(even if I eventually do!). So I'm leaving this as is for now. I'm very happy with it. I just can't tell if it will survive with so much undeveloped white paper. But I do have sense enough, finally, to leave it sit for now and not go back into it. I'd love to leave is as is. But I need to take a break and see if that will work or is just wishful thinking on my part. The title of this post, 'Magic Geese', by the way refers to their beauty. Many people just think of Canada Geese as pests. And I can understand that view when 100s of them congregate on your lawn, leaving their little presents. But when you sit down and try to draw them you can't help but see how beautiful they are, in structure, value and color. As we've become more experienced with birding we've learned a lot about when birds migrate: always earlier than you think! Both in the spring, when they're heading north, and in the fall, when they're heading back south. The Pennsylvania Birding List, sponsored by Audubon, helps a lot. Though I've seen very few warblers in Philadelphia recently, reports on the list show that warbler, and other migration, has been heavy throughout Pennsylvania for at least the last week. Yesterday we spent a 30 minutes hunting for the Swallow-tailed Kite that's been around for a week and then another 60 minutes birding Morris Arboretum in the late afternoon. We saw a couple of Solitary Sandpipers and a Great Egret at Morris but no warblers. So today it seemed like a good day to go to Carpenter's Woods and see what warblers might be there. Good choice! Seven different species: Canada, Northern Parula, Common Yellowthroat, Black-throated Blue, Magnolia, Black and White, and American Redstart. 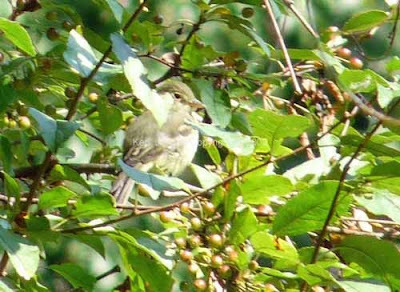 Our first real look at fall warbler migration and always a pleasure! For all except the Canada we saw multiple birds. We also got a good look at a flycatcher that we finally puzzled through to be a Least Flycatcher. Two Ruby-crowned Kinglets, at least three Ruby-throated Hummingbirds and a Veery and Wood Thrush were among the other highlights. 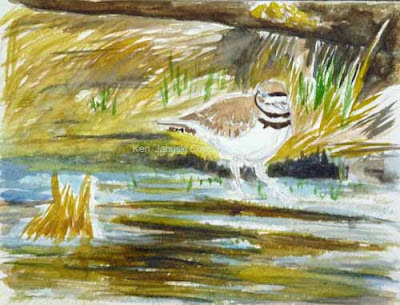 Over these two days of birding I've had my sketchbook with me, and my camera. In the long run I'll be better off just using my sketchbook. 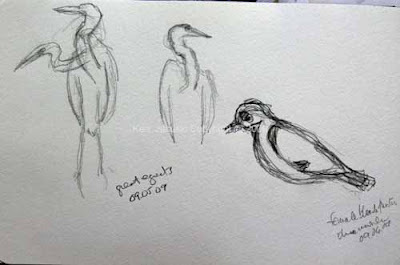 Not only is there something thrilling about drawing a bird that you know may move at any moment, you also generally get better fieldmarks so that you can confirm an ID. I immediately noticed the prominent eye-ring in the Least Flycatcher show above. But I didn't have time to try to draw it. Fortunately the photo above confirmed the eye-ring. On the other hand I remembered seeing the legs of the Solitary Sandpiper pictured above as being yellow, like a Lesser Yellowlegs. 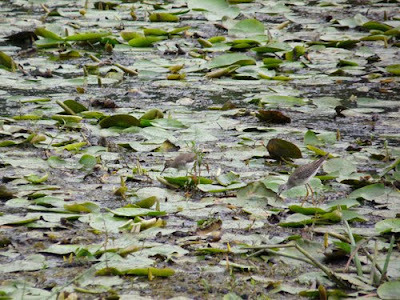 But other aspects of the bird made me think Solitary Sandpiper. When I got home and looked at the photo it confirmed, even though photos can easily lie, that the legs were dull greenish yellow. So that helped confirm that the bird was a Solitary Sandpiper not a Lesser Yellowlegs. If I'd actually sketched it I'm sure I would have noticed the real color of the legs and not needed any evidence from a camera. I had my camera with me again today, with all the warblers, and did try one quick and failed photo of a Northern Parula. 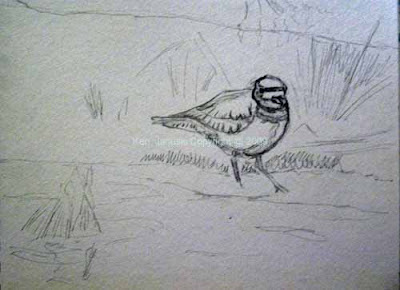 But as I looked at a fidgety female Black-throated Blue warbler I told myself I had to get out the sketchbook and try sketching it. This seemed impossible. The bird would not sit still. And I didn't have my scope, just my binoculars. That meant I needed to look through them, try to remember what I saw, and then put it down on paper. What happened when I did this? Well a flurry of questions: how do the wings connect to the head and the tail? What about the legs? It was hopeless. 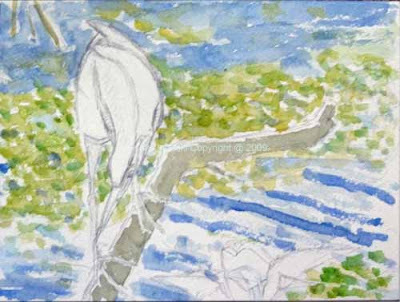 The drawing at top, which includes a couple of live sketches of a Great Egret at Morris, is a composite. First I tried to draw the torso, then the head, then the tail. It is horrible!! No doubt about it. But I needed to start. And learned something. In the future I'll pay more attention to how the heads of most warblers attach to the body. I was too busy noting fieldmarks, like the spot near coverts on wing to grasp the entire structure. You really need to do that to be successful. So this is one of those drawings that is embarrassing to post. But I hope that one day I can look back at it and say: Boy I sure have improved! I remember when I put sparrow heads on warbler bodies!! Hopefully I'll soon have the opportunity to sketch some more warblers. 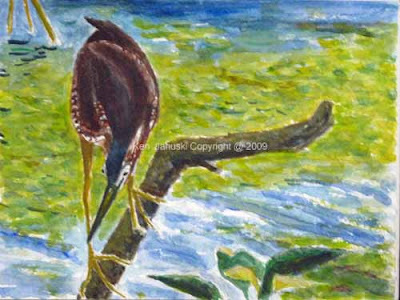 I finally got around to trying a small watercolor of the striking first year Green Heron that Jerene and I saw at Tinicum last week(and the subject of the previous post). 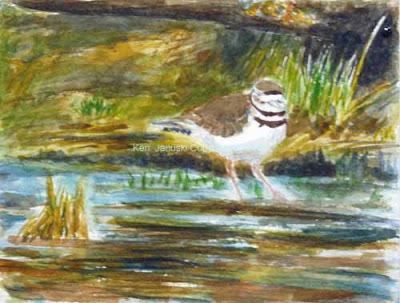 This watercolor is based on a combination of photos and the field sketches I did that day. Since I always seem to have trouble with backgrounds in my watercolors I decided to put that in first. I also wanted to keep the striking colors of the light green vegetation and light blue water. 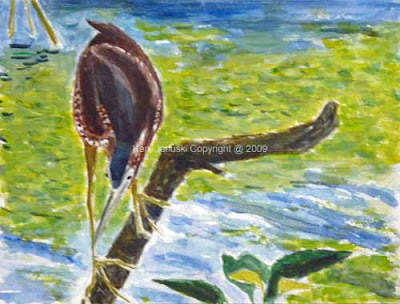 That would be true to what I saw but I was hoping it also would set up a striking counterpoint to the dark, deep colors of the heron. I soon realized though that, once again, I'd used values that were too dark. Both the water and vegetation should have been lighter, and possibly more of a wash. One other thing I wanted to do was make sure that the limb on which he sat didn't become too dark. This has been a problem I've seen after the fact in much of my recent work where birds sit on branches. I often tend to make them too dark in value, even if they are that dark in reality. The problem is that the dark value can just be too strong for the rest of the work, like a tuba blaring in the middle of a violin solo. So I started this branch much lighter. But as you can see it didn't stay that way long. Soon I had two areas that were too dark. Always more to learn about how to use watercolor!